A 19-year-old from Western Australia has invented an unmanned aerial vehicle that is capable of flying five times longer than many drones currently on the market. 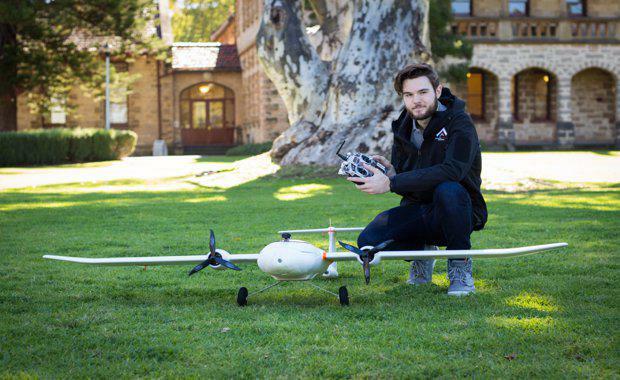 Tom Maclaurin, a law student from The University of Western Australia, said what initially started off as a hobby building remote control aeroplanes at school, developed into a bigger passion. “What I’ve built is a fixed-wing unmanned aerial vehicle that can be operated remotely,” Maclaurin said. Maclaurin said his device could have many useful applications aside from beach patrols including monitoring crop levels, dam levels, and cattle locations and could be used by councils and government authorities to monitor particular areas of land. Maclaurin was recently awarded Student Start-up on the Year at UWA’s Innovation Quarter (IQ) Awards for his invention. The IQ Awards recognise innovation, entrepreneurship and research expertise for start-ups that make a difference in the community.